Space is mostly vast and empty. So whenever we notice something like ripples on a lake, on the frozen moon of a gas giant, we take notice. At a meeting of the American Geophysical Union in San Francisco this week, it was reported that Cassini images of Saturn’s moon Titan showed light being reflected from the Ligeia Mare, a frigid sea of hydrocarbons on that moon. 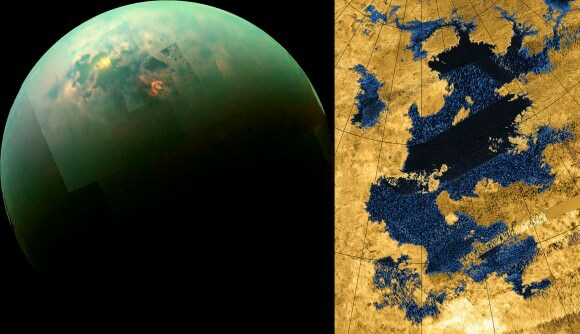 Subsequent images showed the same phenomenon on two other seas of Titan, as well. These are thought to be waves, the first waves detected anywhere other than Earth, and suggest that Titan has more geophysical activity than previously thought. The left image shows a mosaic of images of Titan taken by the Cassini spacecraft in near infrared light. Titan’s polar seas are visible as sunlight glints off of them. The right image is a radar image of Kraken Mare. Credit: NASA Jet Propulsion Laboratory. Planetary scientists are taking note, though, because these waves show that Titan has an active environment, rather than just being a moon frozen in time. It’s thought that the change in seasons on Titan is responsible for these waves, as Titan begins its 7 year summer. Processes related to the changing seasons on Titan have created winds, which have cause these ripples. There’s other evidence of active weather on Titan, including dunes, river channels, and shorelines. But this is the first observation of active weather phenomena, rather than just the results. All together, it shows that Titan is a more active, dynamic environment than previously thought. Titan’s hydrocarbon lakes are thought to be up to 200 metres (656 ft.) deep, and are clustered around the north polar region. Just one of its lakes is thought to contain approximately 9,000 cubic km of methane, which is about 40 times more than the Earth’s reserves of oil and gas. Titan is the second largest moon in the Solar System, second only to Ganymede, and both moons are larger than the planet Mercury. Titan was discovered in 1655 by Christiaan Huygens. Planet mining? For a planet that is starving for more sources of energy, this could be the break human kind is looking for. Considering the time, energy and expenditure of money and resources this would require just to bring back gasses that release more greenhouse gasses into our atmosphere when burned, this isn’t a viable solution by ANY stretch of the imagination.